mer. Stock car races are now held at Deep Creek Speedway on Sundays during the summer. Some residents believe that beauty contests and musical programs will come in the near future. After more than thirty years the State of Maryland is taking positive action to provide a free recreation area for the general public. There has been some delay, caused by the usual clamor of a few property owners for higher purchase prices. When the legal cases have been decided and the area has been developed, it will provide Western Maryland with a public park such as neighboring states already operate. It is to be hoped that an enterprising business man, or hotel chain, will soon see opportunity at Deep Creek Lake. There is no large hotel anywhere on the shoreline, and the only hotels anywhere in the vicinity are in Oakland, Mt. Lake Park and Grantsville. Although the summer season is short, hunters and fishermen would make use of good hotel facilities during most of the year. Also, a fine hotel would probably attract many tourists and summer residents. 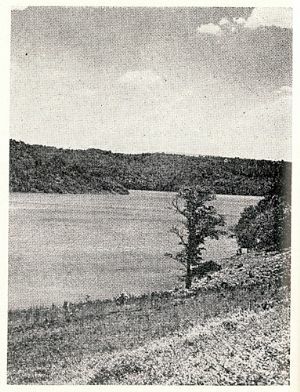 Deep Creek Lake looking from U. S. Route 219.